Marni Landry, K12 STEM Outreach Manager (left), and Corinne Araza, Director of K12 STEM Outreach Program and Development, helmed webinars recently on the National Catholic Educational Association’s website to help Catholic school educators with their science, technology, engineering and math efforts. The web workshops are steppingstones for future webinars by GCU’s Strategic Educational Alliances as it increases its web presence. Grand Canyon University’s STEM advocates have done the math: If you want to be a global leader, the future is in science, technology, engineering and math. Yet, the United States is woefully under-represented in those fields. If you ask Corinne Araza, GCU’s Director of K12 STEM Outreach and Program Development, that simply just won’t do, so she and the other STEM cheerleaders in Strategic Educational Alliances have organized regular workshops that bring teachers and students to campus to ignite STEM education. The latest effort: SEA’s first STEM-related webinars. 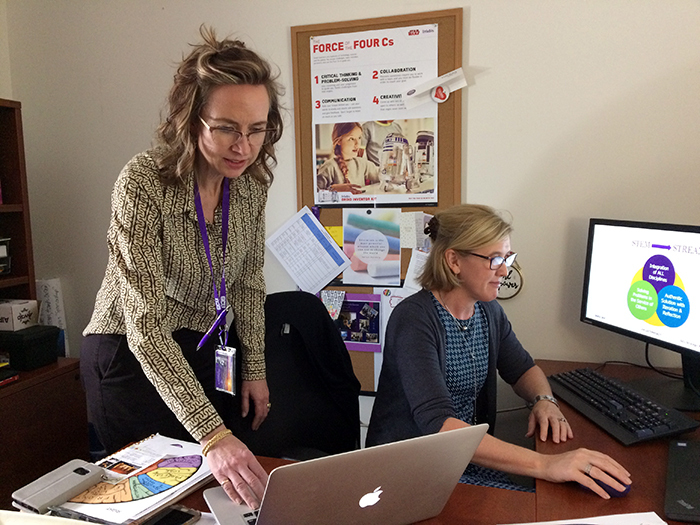 Araza and Marni Landry, the University’s K12 STEM Outreach Manager, honed their educational powers to conduct two webinars for the Virginia-based National Catholic Educational Association this month – webinars that are steppingstones for GCU’s own platform of webinars and podcasts in the 2018-19 academic year. “Between the two of us, we’re like the Dynamic STEM Duo,” the high-energy Araza said from her office in the Academic Administration Building. Araza, seen in the window (above left) in a recent webinar for the National Catholic Educational Association, said GCU recently partnered with Teaching Channel Plus and will soon have its own platform for webinars. She and Landry were connected to the NCEA through Jeff Glosser, the SEA director who works with Catholic schools. As part of the University’s partnership with that organization, GCU was asked to contribute a webinar that would be hosted on the NCEA’s website. Of course, Araza and Landry were ecstatic at the idea of conducting STEM webinars for Catholic educators who want to make their classrooms STEM-ready. “Especially in the Catholic classroom and the Christian classrooms, it’s a little more challenging sometimes to bring STEM education because of funding and that sort of thing. But many Catholic and Christian organizations are very interested in STEM and STEAM (STEM with an arts component), and sometimes they even call it STREAM – science, technology, religion, engineering, art and math,” Araza said. Araza and Landry helmed a two-part “STEM Ready” webinar for the site (click here to watch the first webinar). Part one focused on branding and leadership. Landry said it included a self-assessment on how STEM-ready educators considered their classrooms to be; how teachers are helping their students, staff and community understand they’re STEM-focused; and then asked teachers to look at what they already are doing at their schools when it comes to STEM and to capitalize on those efforts. “I say things like, how would you say your brand reflects your purpose? When you’re in your classroom, what you do, what you say and what your environment tells your students is important. Is it ‘STEM-ish’?” Araza asked. 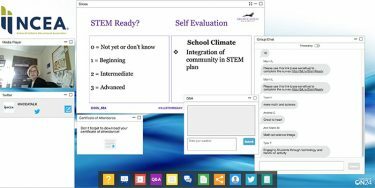 GCU’s Dynamic Stem Duo wanted teachers at that first webinar to question if they have classrooms that allow students to gather research and quantify and analyze data. “You don’t have to study science to have STEM in your classroom, you just have to teach in a scientific manner,” she added. 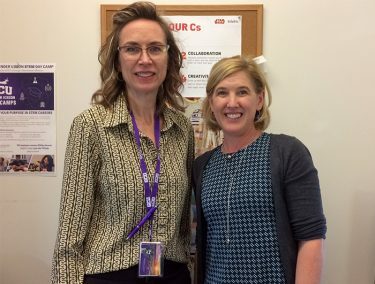 “Dynamic STEM Duo” Landry and Araza of GCU’s Strategic Educational Alliances are hoping to host a webinar every other month to help educators in their professional development. The second “STEM Ready” webinar covered best practices for STEM learning. One of the goals of these webinars, Landry said, is to give educators some real take-aways. Both of the web conferences are up for viewing on the NCEA website. Araza and Landry said they are a launching pad for future GCU-based webinars and podcasts as SEA increases its web presence. “We are now partnering with Teaching Channel Plus and will have our own platform for webinars moving forward,” Araza said, adding, “We will move forward in different professional development topics, but, by and large, to start out it’ll be STEM-ready topics,” Araza said. The hope is to launch one of those webinars in August to kick off the next academic year. The August online seminar likely will tout a big event for SEA – its first speaker of the academic year, Amber Strunk, Outreach Coordinator for LIGO. Physicists at LIGO — the Laser Interferometer Gravitational-wave Observatory — work to detect cosmic gravitational waves. It is the largest and most ambitious project ever funded by the National Science Foundation and was conceived, built and operated by Caltech and MIT. “What’s so cool about LIGO is they study black holes and they study the speed of light, and in 2017, physicists there won the Nobel Prize for basically proving part of Einstein’s Theory of Relativity by the measurement of light. It’s fascinating,” Araza said. Araza and Landry also will head to LIGO to participate in a workshop and then bring that knowledge back to the kindergarten through 12th-grade educators in Arizona to pass on to their students. “Our Arizona science standards just changed, so there is a new standard many of our teachers don’t know what to do with. It’s a physics-based standard, so when I brought that standard up to Amber, she said, ‘Oh yeah,’ I’ll show you how to do that up here,” Araza said. Expect to hear a lot about Strunk and LIGO when SEA kicks off the GCU-based webinar series in the fall. Plans are to grow the series to once every month, possibly more if the audience is there. The Dynamic Stem Duo will be ready for it.